A safe home for all your data. 📁 Access your Data You can store your files, contacts, calendars and more on a server of your choosing. 🔄 Sync your Data You keep your files, contacts, calendars and more synchronized amongst your devices. 🙌 Share your Data …by giving others access to the stuff you want them to see or to collaborate with. 🔒 Security with our encryption mechanisms, HackerOne bounty program and two-factor authentication. 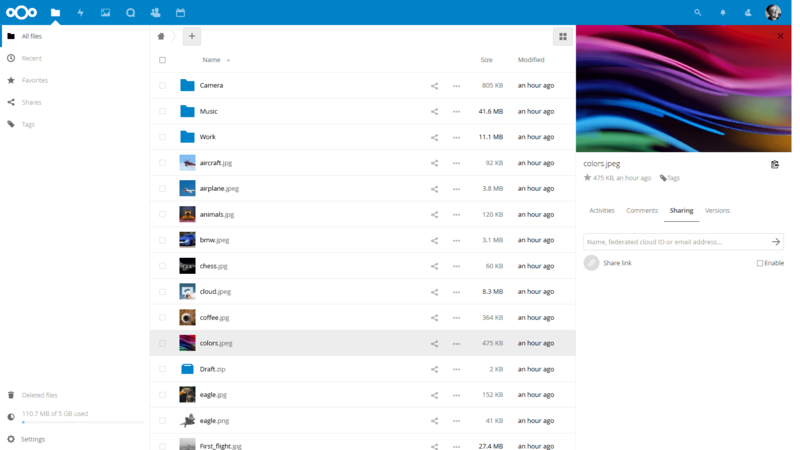 You want to learn more about how you can use Nextcloud to access, share and protect your files, calendars, contacts, communication & more at home and at your Enterprise? Learn about all our Features. ☑️ Simply sign up either through our website or through the apps directly. Enterprise? Public Sector or Education user? You may want to have a look into the Enterprise Support Subscription provided by the Nextcloud GmbH. You can also get support for Nextcloud! 👩‍🔧 Create a branch and make your changes. Remember to sign off your commits using git commit -sm "Your commit message"
🎉 Wait for it to get merged! Third-party components are handled as git submodules which have to be initialized first. So aside from the regular git checkout invoking git submodule update --init or a similar command is needed, for details see Git documentation. Several apps that are included by default in regular releases such as First run wizard or Activity are missing in master and have to be installed manually by cloning them into the apps subfolder. Otherwise, git checkouts can be handled the same as release archives, by using the stable* branches. Note they should never be used on production systems. When making changes, also commit the compiled files! We still use Handlebars templates some places in Files and Settings. We will replace these step-by-step with Vue.js, but in the meantime you need to compile them separately. All contributions to this repository from June, 16 2016 on are considered to be licensed under the AGPLv3 or any later version. Please review the guidelines for contributing to this repository.